Jim Ballard – What is a memory? 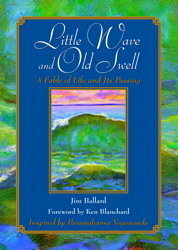 Jim Ballard is a nationally known life coach, a motivational speaker, and an author (Little Wave and Old Swell, Mind Like Water, and others). His fables challenge readers to manage their minds to generate joy by letting go of the whirlwinds of life. Jim’s blog, Coach Jim, offers encouragements for the day – a good day. Jim will be featured here in a 3-part series defining memory, making memory, and living memory. The word “memory” can be teased apart into strands that encompass more than just a factual occurrence. Part 1: What is a Memory? Before speaking of creating memories, what is it about a memory that would make us want more of them? When we recall a “precious” memory in a nostalgic way we’re doing more than just recollecting something, like what we had for breakfast. So, what is the difference between a memory and something merely recalled? A memory has personal meaning. A memory helps us remember something about ourselves that is notable. It may evoke a value, such as friendship, fun or travel. It may bring loved ones closer. It may call to mind an event that was special. A memory evokes positive feeling. What we call a memory is important because it makes us feel good. It may recall a special place or time, or it may bring tears because it touches the heart. It may recall a difficult time, but recreate the good feeling of having overcome odds. A memory helps us define who we are. It may even have the importance of what some call a defining moment. Recalling what we’ve achieved can help us face a present challenge. The memory of one who inspired us can do that again. Stay tuned as later this week Jim discusses the interesting concept of creating good memories. Do we have control over our memories?